Holds ski boots, helmet, gloves, goggles, and more! The Ski Boot and Gear Bag is a premium quality bag designed to carry a pair of ski boots and tons of other gear. In fact, it has so much space that carrying two pairs of ski boots is not out of the question. The Ski Boot and Gear Bag's design is the very popular trapezoid style boot bag. This design lets you put your boots in the padded outside pockets while leaving the large center compartment open for other gear. One advantage of this style of boot bag is that it keeps your boots isolated from each other and the rest of your gear. This prevents them bumping and scratching things and keeps any moisture they retain out of the main compartment that may house dry gear. While this bag is probably too big to be used for airline carry-on, the advantage is that is large enough to carry all of your ski outwear for a week's worth of riding. The 70 liters of carrying capacity let you bring along your pants, jacket, helmet, goggles, and probably even more. In addition to the main compartment and boot compartments, there are other pockets that are easy to access and make great places to store smaller personal items like sunscreen, ipods, etc. Most of the bag is constructed with a strong 840D polyester ballistic fabric. The outer shell has been coated with a water resistant polyurethane coating to keep your bag's contents nice and dry. All bag seems are double needled stitched and all bag zippers are oversized, high quality YKK coil zippers with heavy duty web pulls. There are integrated vents in the bag that allow for plenty of airflow and prevent your wet boots from getting moldy. Since a fully loaded boot bag can be heavy, special care has been taken in designing the backpack straps. The straps are contoured for superior comfort and can be independently adjusted using the load straps. There is also an adjustable sternum and waist strap. The straps are also hide-away which means they have a special pocket they can be placed in. This is perfect for when you want to check the bag on airlines. A great feature about this bag is that it integrates seamlessly with Sportube's hard ski cases using their Hitchin technology. 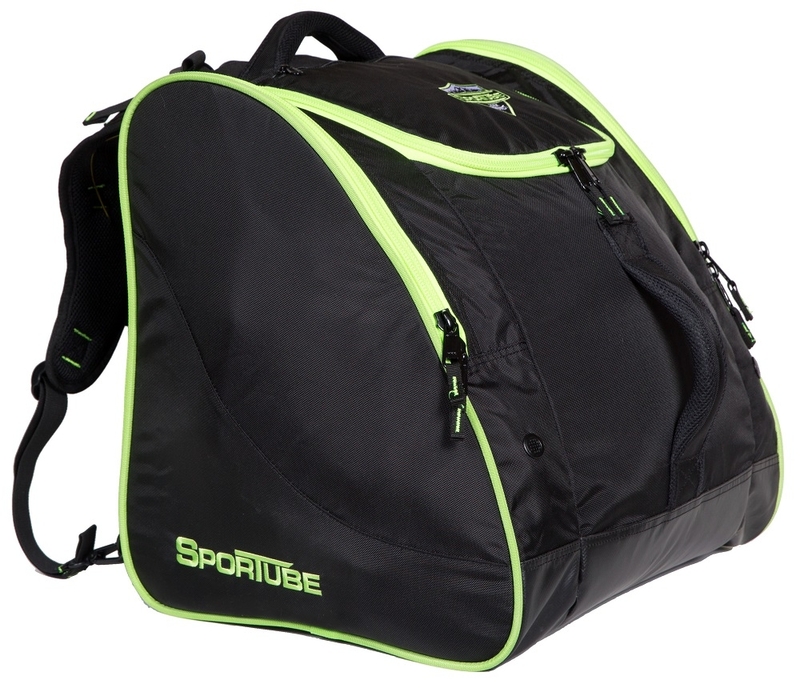 Essentially, Sportube has designed it that this bag can easily "piggyback" on the bottom of their hard ski cases. Together, a hard ski case and this bag make a complete transport system for all of your ski gear. Since Sportube's hard cases can be rolled, it creates an effortless way to roll everything around in an airport or parking lot. 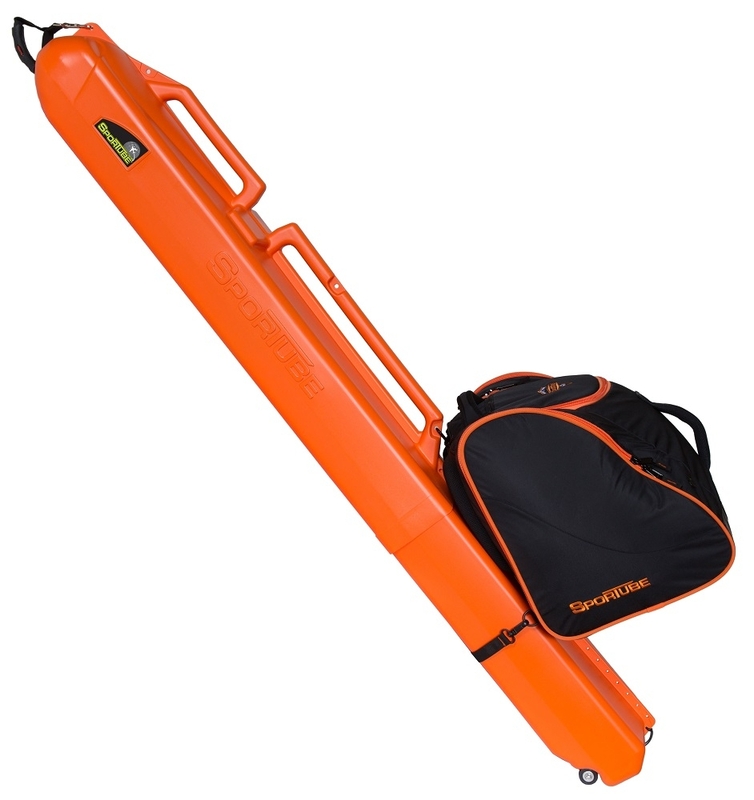 If you don't already have a way to transport your skis, then we recommend one of their hard cases because there is not a safer way to transport your skis. Looking for something a little smaller? Check out the 50-liter Ski Boot Gear Bag and Backpack!